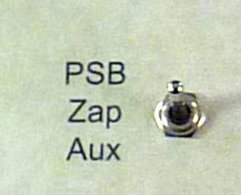 The zapper function can be selected by moving the 3 way switch to “Zap”. It has been estimated that the average adult male is unknowingly contaminated with up to 2 pounds of parasites in the blood and bodily organs. There is an association between parasites and disease that is being progressively discovered and confirmed in scientific and medical circles. Through removing the hidden parasites in our body, we clear the way for our own body’s immune system to get to work and conquer disease. The Zapper Function safely and painlessly electrifies the blood using specific frequencies to kill, and thereby eliminate parasites. In addition to eliminating parasites, the Zapper Function eliminates viruses, bacteria and fungi through application of certain frequencies while electrifying the blood. The frequencies literally explode viruses, bacteria and fungi much in the same way that an opera singer shatters a wine glasses through applying the correct sound frequency at the correct volume. The frequencies are completely safe to all other components of the human body. In 1995 Dr. Hulda Clark Ph.D N.D. released a book describing her research and case studies made over the previous 10 years titled The Cure for all Diseases. In it, she claimed all human diseases were related to parasitic infection, and also claimed to be able to cure all diseases, including cancer and HIV/AIDS, by destroying parasites through zapping them with an electrical device which she designed assisted by her son. We were thus introduced to the words The Zapper, and to Blood Zapping. According to her latest research, Dr Clark claimed that through zapping, we actually “wake up” our own white blood cells. The average human is normally subjected to numerous toxins from the foods we eat, the water we drink, pharmaceuticals and so on, which tends to have the effect of reducing the responsiveness of our white blood cells, causing them to “go to sleep” or to be anesthetized thereby opening us to disease. Dr Clark found that the current from the zapper tended to activate the white blood cells, and with the assistance of the electrical current frequency which effectively shatters parasites, bacteria and viruses, the white blood cells effectively become what Dr Clark termed super white blood cells giving us considerably improved immunity. The World Health Organization says parasites cause so many illnesses and are actually the #1 health problem worldwide. Studies show everyone has 1 to 2 pounds of parasites. Dr. Robert Thiel’s study shows zapping can kill parasites, bacteria, viruses and fungus. Medical studies show zapping can kill cancer. Until the development of Photon Sound Beam Complete, there was no zapper in existence that had a unique delivery system through the use of the plasma tubes and the RF probe. The only ways previously used to get the frequencies into the body were through metal plates, tourniquet applicators and so on. Holding the plasma probes in the hands is the most effective means of delivering the frequencies. The Zapper Function uses the 2500Hz frequency, as well as all of the harmonics of 2500Hz. This frequency has been well researched, and is used by some other companies that build zapper devices. As well as applying the 2500Hz frequency and its harmonics through the unique plasma tube applicators, the zapper function uses 3 other frequencies that are designed for deep penetration of the 2500Hz frequency into the body. The 3 frequencies are emitted by the RF probe, which copies the frequencies being emitted by the plasma tubes. The deep penetration frequencies are just another advantage making the zapper unique and even more effective than any other zapper unit ever built.